Having coeliac disease means that most convenience foods are out of the question - especially when you add other allergies and intolerances on top of that! 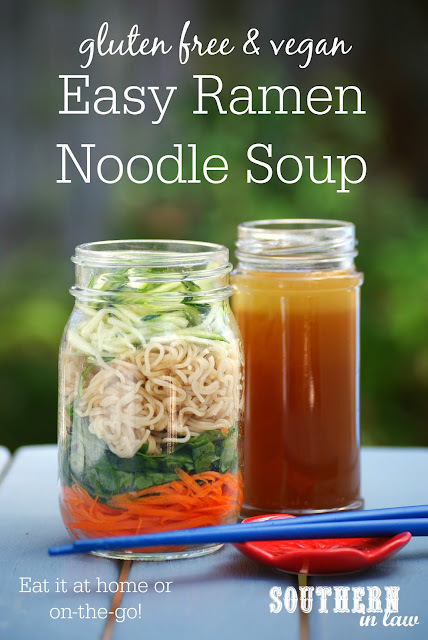 Luckily for me, I was a pretty fussy kid and didn't have too many convenience foods that I actually ate, however, as fussy as I was - I still loved to "share" my Mum's noodle soup from this authentic Asian restaurant. "Share" because Mum would always order it for herself (after asking me if I wanted my own and receiving a solid no) and I'd end up eating half of it. If it was just for me, it would go uneaten (because let's be honest... fussy Kristy only wanted to noodles and not the dumplings which Mum loved) but if Mum had it? I'd happily eat hers. 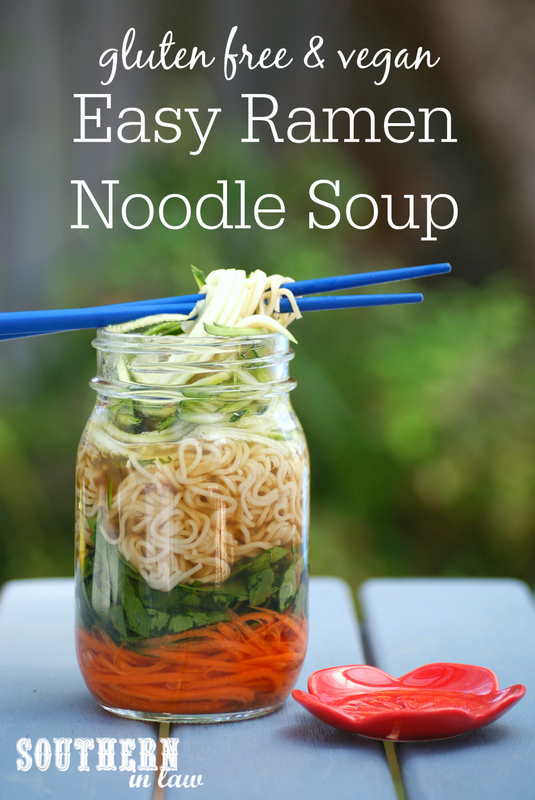 This recipe was inspired by that noodle soup, however, the reason I first made it was actually because of Jesse. He joked one night that he just wanted ramen for dinner and I took that joke and ran with it - turning a "lazy food" (according to Jesse) and turning it into something extraordinary. Now it's a dinner we eat all the time and I even make it up for lunches in the wintertime as it's the perfect thing to make in advance and enjoy later. All you have to do is add all of your ingredients, have a separate jar or container of stock and heat and eat when you're ready for it. Whether you put it in a jar (which I did only because it's prettier) or a bowl, it's a delicious and easy meal that everyone will love. Vegetables/protein of your choice. We use finely julienned carrot and zucchini (put it through your spiraliser if you like! ), chopped baby spinach leaves, bok choy, corn, peas or whatever we have in the fridge. You can also add cooked chicken, beef or tofu for extra protein! To make your soup in advance: Cook your noodles according to package directions, drain and rinse. 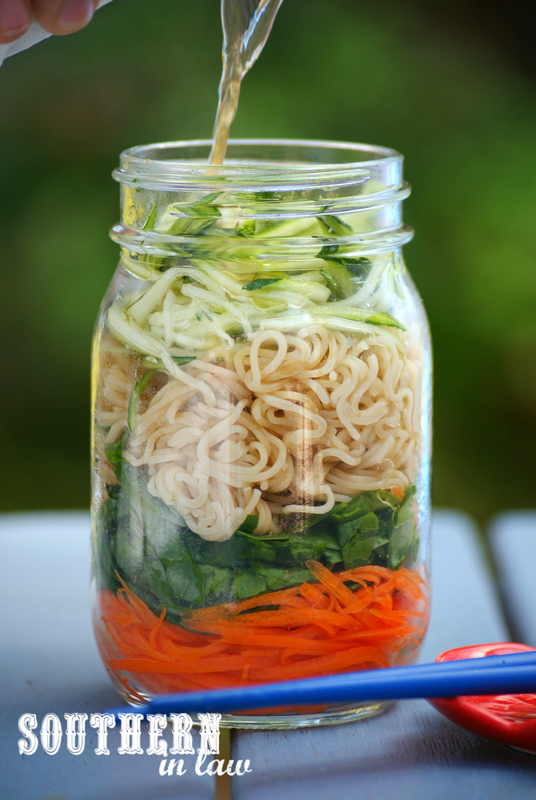 Add your cooked noodles and chopped/prepared veggies to a container or jar, cover and store in the fridge to enjoy later. Mix together your broth, coconut aminos/soy, sesame oil and salt and pepper in a jar or container and store in the fridge to enjoy later. When you're ready to eat, heat your broth in the microwave or on the stove and pour over your noodle mix. Garnish with your desired toppings and eat! You can also heat your broth in advance and keep it hot in a thermos if you don't have access to a microwave. Place your broth ingredients in a medium saucepan. Add your noodles and turn the heat to medium-high. 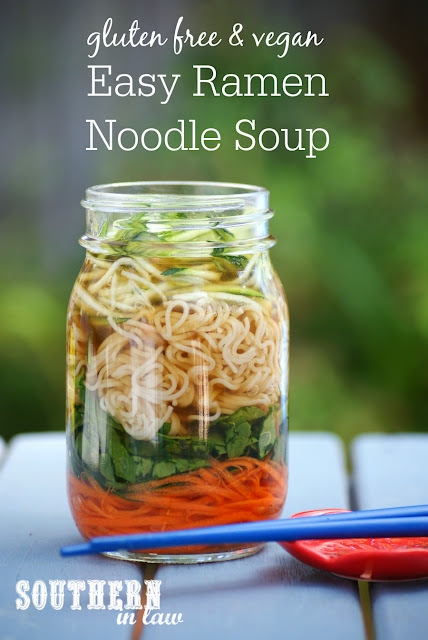 If needed, add some boiling water to ensure your noodles are covered by broth. When your noodles are almost cooked, add your vegetables and cooked protein to the pot, stirring to heat through. Once all of your ingredients are hot and your noodles and vegetables are at your desired texture, carefully pour your soup into a serving bowl, garnish and enjoy! If you're cooking to eat straight away don't worry about cooking the noodles and simply add them to a saucepan with your broth. If you're gluten free use any kind of gluten free noodle or spaghetti. We think these Millet and Brown Rice Ramen Noodles are the best as they don't have the chewy texture of rice noodles. If you're not gluten free you can use regular ramen noodles. If using ramen noodles with a seasoning sachet, simply discard that sachet and use the noodles on their own. But tell me, were you a fussy eater as a kid too? What were the foods you would not touch? And what's your favourite kind of takeaway/takeout? When I was a kid I hated packed lunches (my poor Mum had to deal with knowing I wouldn't eat all day at school and instead fed me when I got home), didn't like any meat and was just generally annoying when it came to food :P Somehow I happily ate veggies though and would take tomatoes everywhere to eat whole with salt and pepper.